Welcome to Exploring Portland’s Natural Areas, a blog devoted to doing just that: getting outside and visiting the many natural areas in Portland, Oregon and beyond. We believe that kids live healthier and more-fulfilled lives when they spend more time playing outside and exploring in nature than with video games or plastic toys (Lego bricks excluded!). Our guide to nature in Portland is Wild in the City: Exploring the Intertwine: The Portland-Vancouver Region’s Network of Parks, Trails, and Natural Areas , edited by Mike Houck and M.J. Cody (Oregon State University Press, 2011), reviewed here. I’ll point you to an Introductory post for Exploring Portland’s Natural Areas to continue learning about us. We hope that by visiting this site you’ll be encouraged to get outside – either by yourself, with friends, or with kids – and if you already spend a good amount of time outside, perhaps you’ll discover a new place to visit. Thanks for stopping by! Have a question or suggestion? Interested in using one of my photos? Drop me a line at michaeldavidbarton AT gmail DOT com. Blogging is fun and purposeful, but also time-consuming. If you like what you see here at Exploring Portland’s Natural Areas, please consider donating. We found you from Your Wild Child and are resident Portlanders as well. My son is recently 6 and I completely hear your number 1 vote of Crater Lake. It is well worth it. Our family traveled down there this summer and you could easily do it in a weekend. It was less a day in the car. Even in July there is still snow on the ground, but it is incredible! I’m glad we found you; we’ll have to stop by often. Well, glad you found us! We moved to Portland in May from Bozeman, MT, and although Mel (Your Wild Child) lives just 15 minutes from Bozeman we never actually met! I found your blog researching natural play. I live in SE Portland and I’m a father of a five year old boy. We try to explore a different natural area every week for an adventure. I was thinking about trying to get together with others to “search and enjoy”. Any interest in tag along adventurer’s? I may also be able to contribute information to the Spring Garden Park natural play discussion but I can’t make the 13th as we’ll be camping. Michael, nice blog, I was looking for local blogs about nature walks and found this. I decided to try writing my own blog focused on walking and put a link on there to your site. Hi Kendall, thanks for following and I’ll check out your blog! My wife and I spent the last few years filming a family adventure movie set in the outdoors. We are trying to connect to blogs that are families hanging out together in nature. We are hoping they would like to help us promote our movie project on kickstarter if they like our movie and its values. Kickstarter.com is a relatively new website that uses crowd-funding to help finance creative projects. Our movie is about a mom who takes her two kids to go visit grandma in the woods. On the way home, the mother gets into a car accident and the kids are left alone in the woods. The six year old plops his baby sister into his back-pack and the two of them make their way back to Grandma’s, encountering hobos, wolves, and raging rivers along the way. Its kind of like the movie ‘Milo and Otis’, but with young kids instead of animals. Thanks for your time and I hope you enjoy the trailer to our film. I’m so glad I found your blog through Portland Parks’ Raven Review. Wow! We are really kindred blog-spirits, as I am also a Portland resident and spend as much time as I can discovering and exploring the rich ecosystem and public park spaces that our lovely city has to offer us. I’m also lucky to be able to do this as part of my job…I’m an environmental educator with Portland Parks & Recreation and have gotten the chance to teach in a number of parks in the area. Because of this interest of mine, I’m also fascinated to see what you write about nature play and I’m looking forward to reading what you have discovered in the Portland area with your son. Invite you to visit my blog…I try to write once a week about a different issue or place I have explored. Here’s to urban exploration! Thank you for stopping by, it’s always great to connect with like-minded folk! Another blog to add to my list (I’ll get a link on here when I get to updating a blogroll). I stumbled upon your blog and I like what you are doing. 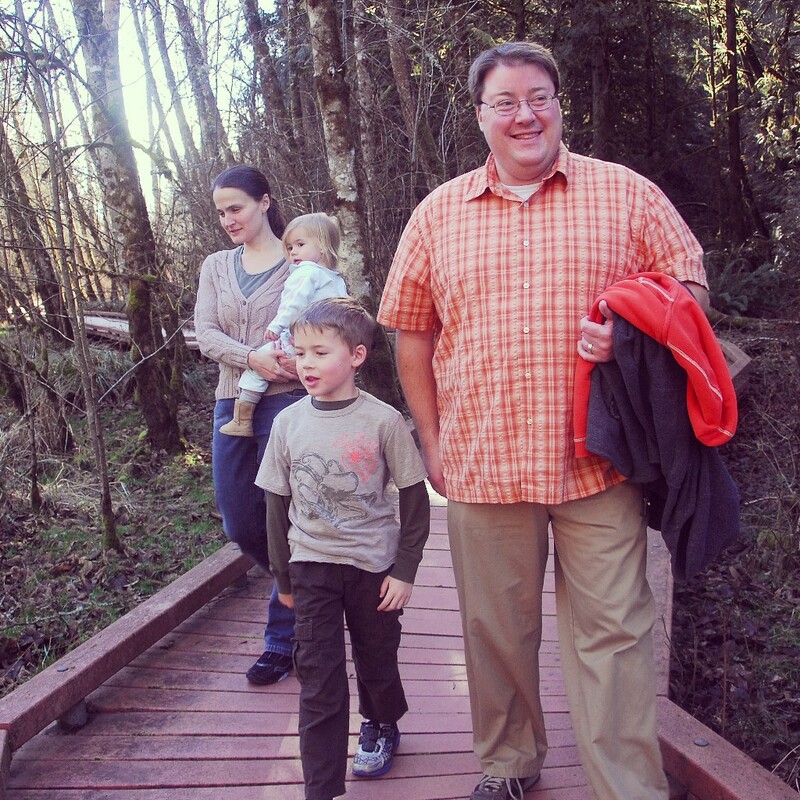 I too am blogging about local nature which is in my case in and around Wilsonville, Oregon. Keep up the good work I will be following it. And yet another PDX area nature blog, This is wonderful! I appreciate your good work. Connecting kids and nature is important, for so many reasons. Although my kids grew up in a city (Portland), I’m pleased that they have an appreciation for nature. I attribute their awareness to parent role models, good teachers, and the parks and programs (Outdoor School, etc.) that are available in Portland. As I now return to Alaska to care for my mom, I’m finding opportunities to share with my kids (18, 21 and 24 years old) some of what I experienced as a child growing up in the “boonies” in AK (Copper Center). This fall, school schedules permitting, I hope to be able to take them on some backpacking/climbing trips while I’m up there. I’ve been telling them they can carry the common gear though. My sons are brutes right now. The best to you and your son on Fathers Day tomorrow. I have been watching your blog for the last year or so, I found it while I was going research for my graduate work on Nature-Based Play. I am a grad student of the Miami University Global Field Program, it focuses on science inquiry and community-based education and the focus of my Master Plan is Nature-Based Play. I have done a large amount of research on the subject and have done a lot of different activities and projects in the school where I work. My focus has been on the importance of access to nature and the benefits children gain from being in nature, but I have recently shifted this focus to educating and encouraging the family as a unit to engage with nature more often. I have been educating the families at my school and am ready to start branching out to the wider community of the Portland Metro Area. As I am entering my last year of my masters, we have been asked to start building partnerships for a ‘Network-of-Change’. At first I thought of your blog and how you and your family are an exact model of what I wish to promote. There is a lot of research out there that says the top two reasons that adults are environmentally conscious is the childhood experiences they had in nature, but most important is the fact that these experiences were shared with family or other adult role models. I would love to open communication with you and hear if you are interested in being a part of me ‘Network-of-Change’. The Museum’s new Outdoor Exhibit opens on Earth Day — it’s the 1.3 acres beside the Museum — intended to introduce parents to nature play by letting them observe their children enjoying it. Let us know if you’d like a preview, or when you might like to come by and play! Thank you for sharing the video! I will watch when I have 14-minutes uninterrupted (when kids are in bed!) and likely post when I put up a post about the grand opening. I am keeping my son home from school that day so he can join me and his little sister for the learning and fun! I’ve already communicated with Emily, and she is sending me some admission tickets. I plan to do a post, too, on our thoughts about Outdoor Adventure.